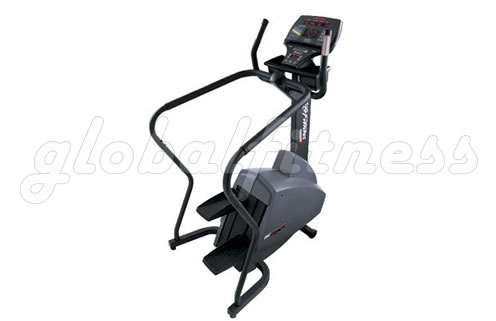 The Life Fitness SC 9500HR Lifestep Stepper can radically step up your performance. The smooth, independent stepping action engages more of your muscles in each leg and glutes and forward-thinking ergonomics promote proper posture and bio-mechanically-correct motion; it's the ultimate stair climbing experience. The Life Fitness SC 9500HR Lifestep stepper features Personal Trainer customizable workouts and the patented Lifepulse digital heart rate monitoring system and Polar telemetry. Standard features for the Life Fitness SC 9500HR Stepper include an accessory tray, integrated reading rack, welded steel frame, 20 resistance levels, support handlebars and rear wheels for easier mobility. The aggressive styling of this stepper has aided in the surge of recent sales but the name behind it is what makes this particular stair climber a sure bet for any guy or home!